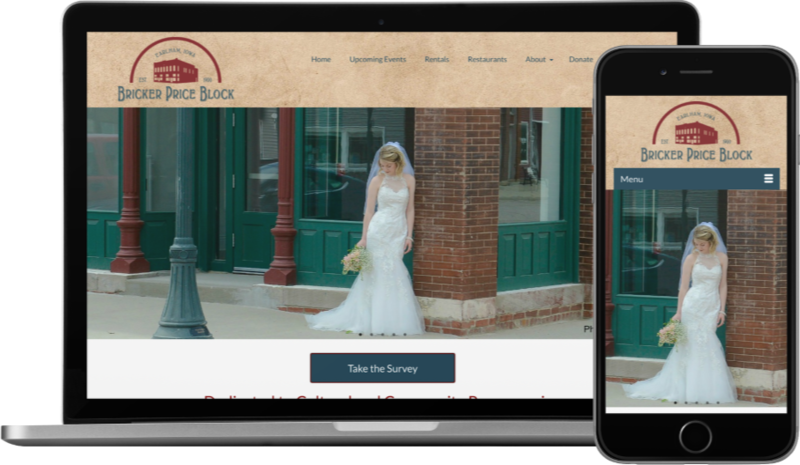 The Bricker-Price Block is rural cultural center and a beautiful venue for events in Earlham, Iowa. The space can be rented by patrons for gatherings such as meetings, parties and weddings, but it also hosts its own lineup of events: musical programs, wine tastings, trivia events, cooking and craft classes, and more. To showcase their ever-changing schedule and make it easy for people to register, the front page features a photo and description of each event, with a link to purchase tickets (except for free events). These are also included on an interior page of the site with an embedded Google calendar, which shows the whole month at a glance. Contact Winterset Websites for responsive web design in central Iowa.